IRELAND’S five-person team at last February’s Winter Olympics in PyeongChang were delayed slightly on their return to Dublin, ironically because of unprecedented snowfalls here at home! But Seamus O’Connor, Brendan Newby, Tess Arbez, Patrick McMillan and Thomas Westgaard put in some good performances and captured the attention of many. Snowboarder O’Connor, a semi-finalist in Sochi, finished 18th from a field of 29 in an exceptionally high-standard half-pipe competition, a considerable achievement considering he tore all the ligaments in his knee 18 months previous. The rest of the 2018 team were all Olympic debutants and the two alpine skiers coped particularly well with a lot of wind-enforced delays in South Korea. Tess Arbez performed almost 20 places above her ranking by finishing in the top 50 of both the women’s Slalom and Giant Slalom. Clareman Patrick McMillan, who became only the second Irishman ever to compete in the Downhill, the blue riband of any alpine event, had his best result in the Super-G (48th). Brendan Newby made history as Ireland’s first ever competitor in half-pipe skiing where he finished 22nd and Norwegian-Irish cross-country skier Thomas Westgaard had his best result in the Skiathlon (15km x 2) where he was 60th. 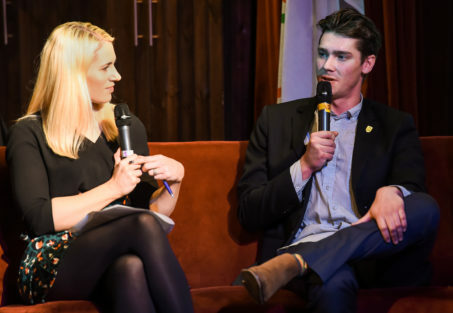 Speaking at the event is MC Evanne Ní Chuilinn during a panel discussion with Irish Olympian Seamus O’Connor at The Sugar Club in Dublin. Since PyeongChang Seamus O’Connor has turned 21 and begun a liberal arts degree in Westminster College, Salt Lake City. Snowboarding only has World Championships every two years and he will be part of the Irish team competing in them in Park City, Utah on February 1-10, 2019. “I was a little disappointed with how I performed in Korea,” O’Connor said. “Looking back at my runs I definitely could have done better so that’s a big driving force going forward but, considering the injury I had beforehand, I think I did well under the circumstances. What’s Next for Winter Sports? 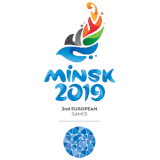 The next Winter Olympics take place in Beijing in 2022 but the next important event for OFI’s wintersport athletes are the 2019 Youth Winter Olympic Festival in Sarajevo on February 9-16. Some of Ireland’s young aspirants for this EYOF are only in the early stages of their FIS (international governing body) careers which enables them to collect ranking/qualification point, so the team is not yet finalised. But those who are eligible age-wise are all alpine skiers and based across three different regions right now. Kate Breen is in the UK, Emma Austin, Elle Murphy, Finn Rice and Matthew Ryan are all based in America and Dubliner Annemarie Lynch is in Switzerland, where she has moved for school in Aiglon College to further her snowsport career. 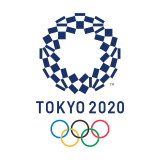 Through our high performance lead we have done a winter sports strategy which we are looking forward to rolling out in 2019 ahead of Beijing 2022. 2019 will also be an exciting year for winter sport with a rollout of scholarships for winter sports.